I’m in the final stretch of finishing the first draft of my sci-fi thriller The Crossover Gene. 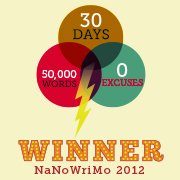 I started this manuscript back in November, 2012 as part of NaNoWriMo. I hit my 5ok word goal and then got back to work on Beyond the Badlands, the second book in my Badands series. Since publishing Beyond the Badlands, I’ve made headway into Revenge In the Badlands (Badlands #3) and I’ve completely revised the 50k words I wrote back in 2012 for The Crossover Gene. Currently, the manuscript sits at 52,186 words with a goal of around 75k. Now it’s time for the final push to finish the manuscript. I have roughly 25k words left to write. To many writers that’s not much at all; maybe a week or so. But for me, with a full-time programming job, a wife and two kids, it’s a challenge. I figure there are others out there like me, writing part-time, who have challenges to face in order to meet their word count goals. Whether it’s difficulty getting started, staying motivated, organizing thoughts or squeezing in time around all the distractions of life, we all have our challenges. So, the plan here is simple: I’m going to write a post each day, detailing the final push to get this manuscript finished. I’ll share a summary of my day and how my writing fared on that day. And I’ll keep it as brief as possible to avoid making it boring. How many hours did I write? How did work or home life affect my writing? How many words did I write? What is my enthusiasm and energy level? What problems did I have to get around? Where did I succeed or fail? I’ll share these experiences so that others might find parallels with their own writing lives. I think this will be a useful exercise for me and hopefully beneficial to others. No wonder I feel burned out after only a few hours of writing. At least I’m not the only one.